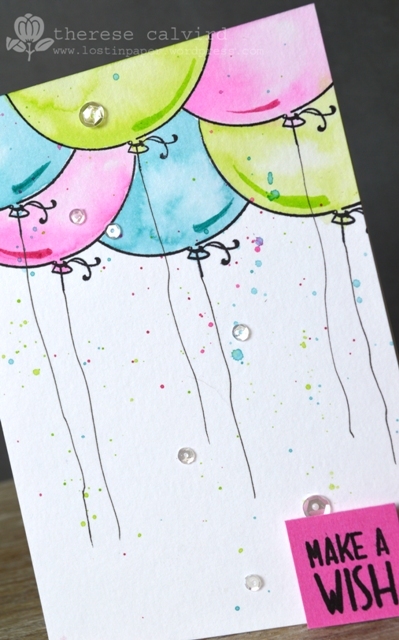 Video : Finding Inspiration By Request – Watercoloured Balloons! Very easy and fun to make card today and can you guess where I found my inspiration…? I’m filmed as I created so you can watch the process. Other Supplies: Distress Markers – Picked Raspberry, Twisted Citron, Peacock Feathers. < Previous Ellie is Creating a Scene! Next > Supercathero / Green Lantern….. ish? Nice card Therese, bit of inspiration. Never done any balloon cards, could be time too. I really like how you did this. Super card, love the colors and oh my—I never thought to use distress markers to paint. Thanks. I do have a lot of trouble with watercolor paper…I guess I should break down and buy some Tim Holtz. And, Therese, you never obsess in my eyes…you teach. Love the look you have achieved, gorgeous! Therese!!! 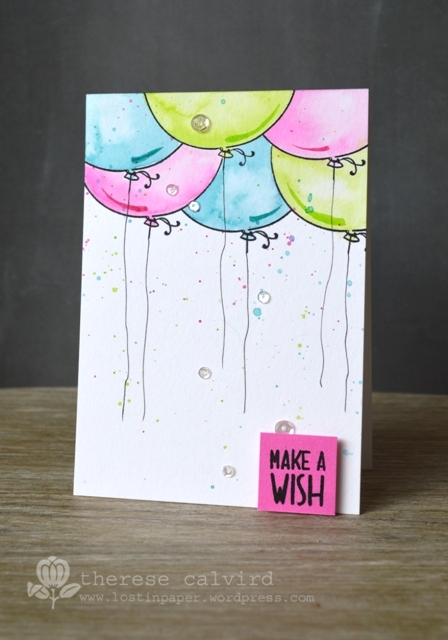 Love your perfectly water-colored card … LOve that balloon stamp … I thought you might do an all-over design with one in color, as you did with your first SuperStar card!! and, oh, I do love maracas in the morning! Wow! The colors and your design is simply the best 🙂 you always are so inspiring !! Yep. Another great video. Have I mentioned that I watch every one you make? But only yours… I just got some good (not Dollar Store) watercolors and have had a bit of time to play with them. Watching this video helps my confidence levels enormously. Such a sweet card in fun colors. The spatters and the sequins are the perfect finishing touches. Love it! Fantastic card and video Therese! I watched your video along my morning coffee. What a nice company I had. Can you believe, I have not made a single card with only balloons on it and every time I see one of yours, I just want to go make one. Beautiful inspiration! Really LOVE this! Wonderful design and execution! I absolutely adore this card!!! So fun. I love the size of those balloons and the colors you used, Therese. I made one similar with smaller balloons and all in the same color.